I tend to go in phases with ingredients; my latest favourite is rice noodles which we are eating several times a week. I inherited a big bag when my friend Helen moved to Washington DC at the start of the year, then another packet arrived with the August Kitchen Nomad box. Cupboard space is scarce in the Fuss Free kitchen, and rice noodles are relatively bulky for the amount you get, so it was time to use one of them up! I actually cannot remember the last time I used rice noodles, or even if I ever have, and I am a complete convert. They tick my Fuss Free checklist by being adaptable, relatively cheap, not high in calories, easy to use and unlike pasta do not stick to each other once cooked. The best thing is that they are instant and require no cooking apart from putting them in a bowl and pouring a kettle of boiling water over them. The South East Asian equivalent of cous cous perhaps? I served the cold slippery noodles in a simple salad served with a fiery (but not overly hot) salsa macha which I learnt about from our friend Monica. The South East Asian / Mexican fusion works very well here with the ingredients complimenting each other perfectly. Salsa macha is a chilli purée – Monica described it as like a pesto – with olive oil containing chillis, nuts, seeds, herbs and garlic. It is richly flavoured, hot, smoky and livened up by the addition of a dash of vinegar. I based mine on Monica’s recipe, using excellent dried casabel and chipotle morita chillis from Mex Grocer. The Casabel chillis literally means jingle bells, so called as the seeds inside rattle, has a woody nutty flavour, and the chipotle morita are gloriously smokey with notes of leather and tobacco; they are so intensely flavoured that Ed thought that I had added some liquid smoke to the salsa macha! I have both chillis in jars on my desk and cannot resist a frequent smell as they are both glorious! 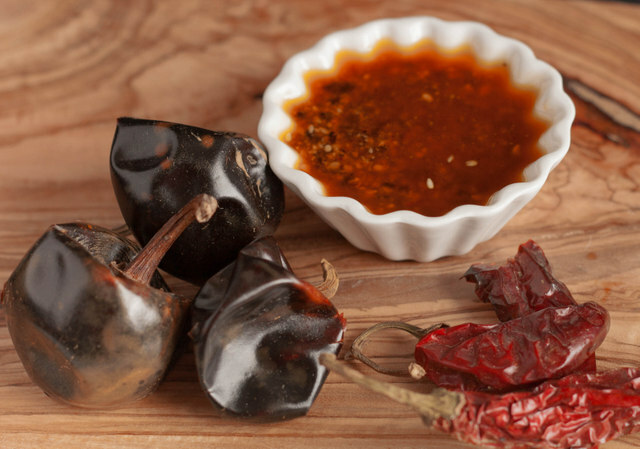 If you do anything this weekend please order some chillis and make salsa macha – you can easily vary the heat levels. You will not regret it – it is delicious, highly addictive and I can see that it will become a staple, and will happily sit in the fridge for a good few weeks. 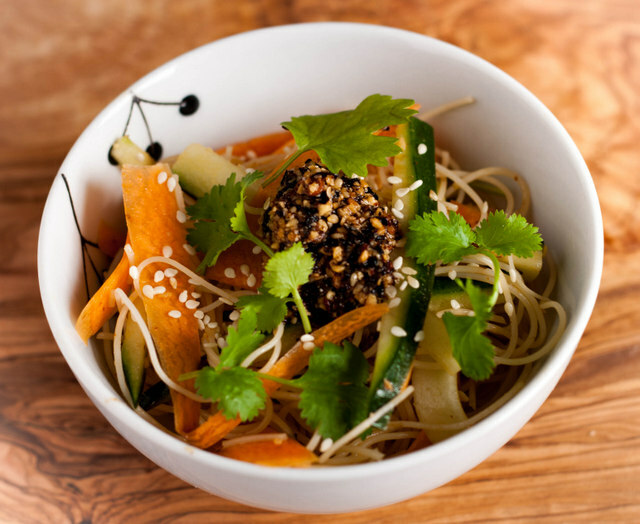 If you try this Recipe: Rice Noodle Salad with Salsa Macha please tag #FussFreeFlavours on Instagram or Twitter. It is amazing for me when for me when you make one of my recipes and I really do love to see them. You can also share it on my Facebook page. Please pin this recipe to Pinterest too! Thanks for reading Fuss Free Flavours! Place the noodles in a large bowl and cover with boiling water and leave to soak according to the packet instructions. Drain and rinse. Whilst the noodles are soaking prepare the vegetables. Mix the drained noodles, carrot, cucumber and lemon juice. 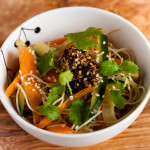 Serve whilst still warm or when cold topped with the coriander, sesame seeds and salsa macha.